(Phys.org)—A team of researchers from France, Sweden and Romania has found genetic evidence that indicates that domesticated dogs developed an ability to digest starch during the same time period as humans. In their paper published in the journal Royal Society Open Science, the team describes how they conducted a DNA analysis of ancient dog teeth and other bones and what they found by doing so. Prior research has suggested that dogs and humans became companions approximately 15,000 years ago—a time during which people were still hunter-gatherers. This meant that both humans and dogs were still eating mostly meat, though the dogs were likely getting mostly left-overs. Three years ago, a team in Sweden found that domestic dogs have many more copies of the gene AQmy2B than wolves—the gene is known to be involved in helping to digest starches, which suggested that dogs have evolved in a way that allows them to more easily co-exist with humans (who also have many more copies of the gene than other carnivores.) More recent research has shown that wild dogs, coyotes and wolves have just two copies of the Amy3B gene, suggesting the domestic dog's ability to digest starch is truly unique among canines. In this new effort, the researchers wondered how far back in time dogs developed the extra gene copies. To find out, they obtained teeth and bone fossils from dog and wolf specimens that have been dug up from various sites in Eurasia and which had been dated back to 5,000 to 7,000 years ago. By conducting a DNA analysis of the fossils, the researchers found that at least four of the dogs had at least eight copies of the gene—they were not able to discover how many copies the wolves had. 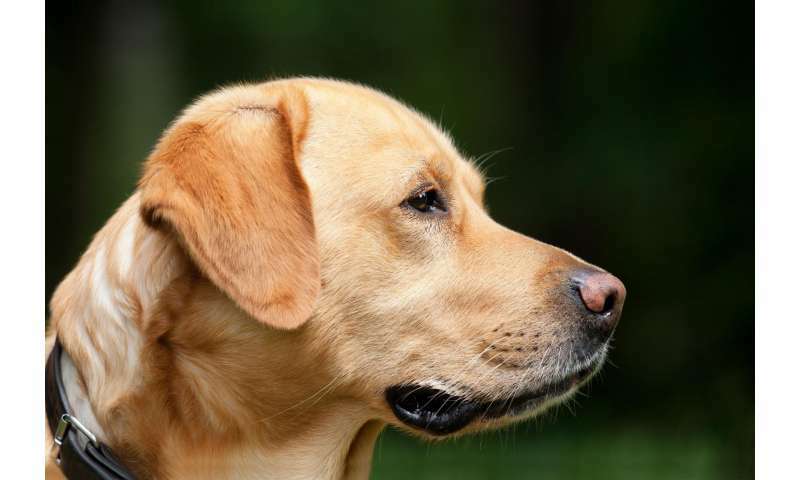 This finding by the researchers overturns theories that have suggested that the gene evolved in dogs in more modern times as humans bred them to bring about many more breeds. The finding also indicates that dogs likely developed a means for digesting starches during the same time period as did humans, a sign that dogs and humans were co-existing and that both were gaining an ability to live at least partly off the crops that humans learned to grow. Extant dog and wolf DNA indicates that dog domestication was accompanied by the selection of a series of duplications on the Amy2B gene coding for pancreatic amylase. In this study, we used a palaeogenetic approach to investigate the timing and expansion of the Amy2B gene in the ancient dog populations of Western and Eastern Europe and Southwest Asia. Quantitative polymerase chain reaction was used to estimate the copy numbers of this gene for 13 ancient dog samples, dated to between 15 000 and 4000 years before present (cal. BP). This evidenced an increase of Amy2B copies in ancient dogs from as early as the 7th millennium cal. BP in Southeastern Europe. We found that the gene expansion was not fixed across all dogs within this early farming context, with ancient dogs bearing between 2 and 20 diploid copies of the gene. The results also suggested that selection for the increased Amy2B copy number started 7000 years cal. BP, at the latest. This expansion reflects a local adaptation that allowed dogs to thrive on a starch rich diet, especially within early farming societies, and suggests a biocultural coevolution of dog genes and human culture. Genesis 1:29-30 clearly indicates that both man, animals, birds and other things were vegetarian from the start - "Then God said, "Behold, I have given you every plant yielding seed that is on the surface of all the earth, and every tree which has fruit yielding seed; it shall be food for you; and to every beast of the earth and to every bird of the sky and to every thing that moves on the earth which has life, I have given every green plant for food"; and it was so"
Just as he created them male and female right from the start. Oh puhleeese. Why don't you quote Dr. Seuss as a reference while you're at it. Makes about as much sense. I wonder what you're doing on a science comment section, anyways. You don't know anything about science and clearly also don't care about science. All you're accomplishing is making a fool of yourself. If that is your intent then: Bravo. You are doing a really good job.